Swipe Elite Power comes with a 5.5-inch (1280 x 720 pixels) HD IPS display whereas Redmi 3s and Xolo Era 2x has a 5-inch (1280 x 720 pixels) HD IPS display. Swipe Elite is powered by a 1.1GHz Qualcomm Snapdragon 210 MSM8909 processor, Era 2x has a 1.25GHz Quad-core MediaTek MT6737 processor and Snapdragon 430 processor on Redmi 3s. Swipe Elite Power and Redmi 3s is priced at Rs. 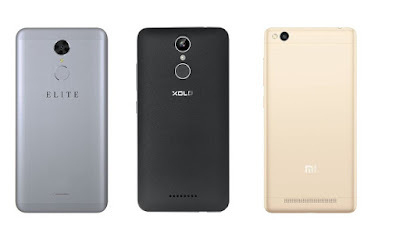 6999.Xolo Era 2X comes in Latte Gold and Dark Gunmetal colors, is priced at Rs. 6666 for the 2GB RAM variant and the 3GB RAM version costs Rs. 7499.Xiaomi Redmi 3s has better processor compared to both but lacks Fingerprint Scanner. Elite power and Redmi 3s has a bigger battery.